The Pepsi Pavilion, created by E.A.T. 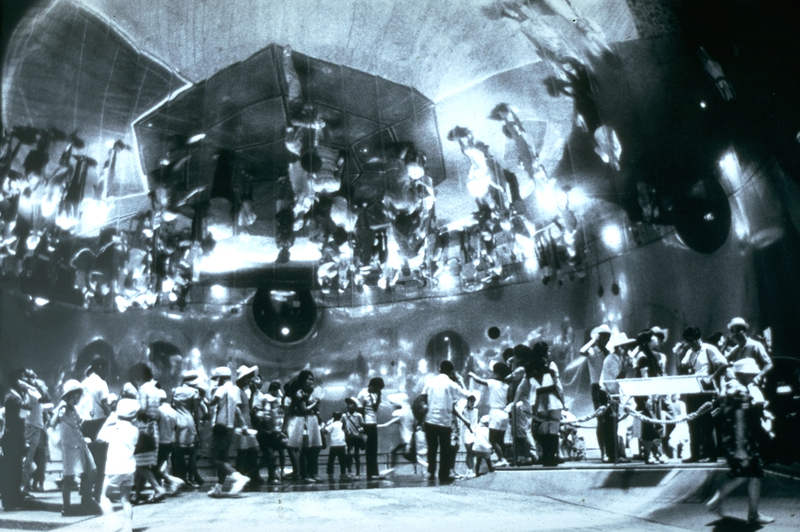 for Expo ’70 in Osaka, Japan, contained a fully immersive spherical mirror that produced real-image, three-dimensional reflections of visitors. The Pepsi Pavilion was first an experiment in collaboration and interaction between the artists and the engineers, exploring systems of feedback between aesthetic and technical choices, and the humanization of technological systems. Billy Klüver’s (director of E.A.T.) ambition was to create a laboratory environment, encouraging ”live programming” that offered opportunity for experimentation, rather than resort to fixed or ”dead programming” as he called it, typical of most exposition pavilions. Secondly, the Pavilion evoked and celebrated aspirations for heightened, non-hierarchical social dynamics built on the aesthetics of agency and transformation brought about through the collective participation of the audience, the artists, and the engineers. The Pavilion’s interior dome – immersing viewers in three-dimensional ”real” images generated by mirror reflections, as well as spatialized electronic music – invited the spectator to individually and collectively participate in the experience rather than view the work as a fixed narrative of pre-programmed events. The Pavilion gave visitors the liberty of shaping their own reality from the materials, processes, and structures set in motion by its creators. A film by Eric Saarinen that documents the research and creation of the Pepsi Pavilion.